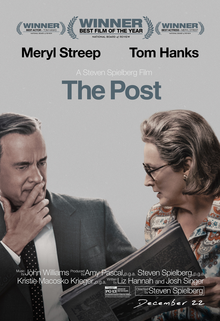 >Dean's Movie Night Features "The Post"
In a special Dean's Movie Night this winter, over 85 students, faculty, and staff viewed The Post. 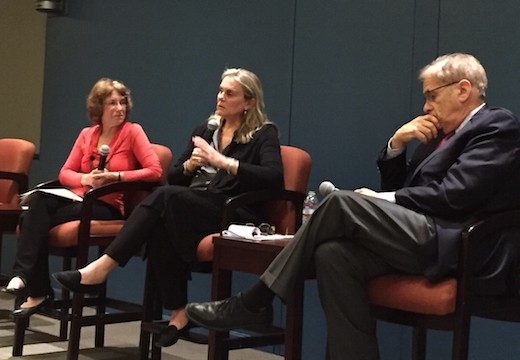 Following the screening was an enlightening discussion by RAND President and CEO Michael Rich, faculty member and former Los Angeles Times staff writer Molly Selvin, and media lawyer and former Los Angeles Times First Amendment counsel Karlene Goller. Given the RAND connection to the events of the story, the audience was eager to see how RAND would be portrayed and to discuss the details of the story's aftermath. Graham’s decision occurred at a time critical for The Post and could have potentially endangered the paper’s initial public offering. The movie highlighted the importance of independent journalism, the challenges of being a woman in the male-dominated newspaper industry in the 1970s, and the moral difficulty of deciding whether to put herself and her coworkers at personal risk to inform the public and serve as a bulwark of democracy. To the enjoyment of the crowd, RAND appears briefly in the film, including a scene in the (fake) front lobby and references to the think tank. Selvin moderated the panel that followed and told what happened after the events in the movie, including the prosecution of Daniel Ellsberg (the case was eventually dismissed due to government misconduct), the Nixon enemies list, and the Watergate break-in. Rich discussed the complexities of the issues of protecting classified and sensitive material. He noted that while the film viewed the leaking of classified documents in this case as an obvious good, researchers at RAND take an oath to protect this information. In addition to classified material, he pointed out that RAND researchers handle sensitive information, from health records to test scores, that could greatly impact individuals if it were to be released. He also discussed the repercussions of the revelation that the Pentagon Papers came from RAND: Henry Rowen, the president of RAND at the time, quit abruptly; the Air Force took control of its classified material and pulled back a significant amount of project work, which resulted in numerous researchers losing their jobs. In addition, the future of the graduate school, which was only a year old at the time, was jeopardized. Goller discussed her work in First Amendment case law at the LA Times, what she saw as some of the major issues for this area of law and journalism, and how the issues debated in the Pentagon Papers case essentially created the media law specialty. She is a media rights attorney who represents authors, filmmakers, journalists, and local and national news organizations. Today's threats to free speech, she relayed, include the increased prosecution of journalists, which ramped up considerably under the Obama administration; technological improvements that allow the government to more easily find and prosecute whistleblowers, especially if journalists do not sufficiently protect their sources; and the reality that new journalistic outfits such as online newspapers are not joining First Amendment associations, which pool the resources necessary to bring or defend very expensive, and important, legal cases.